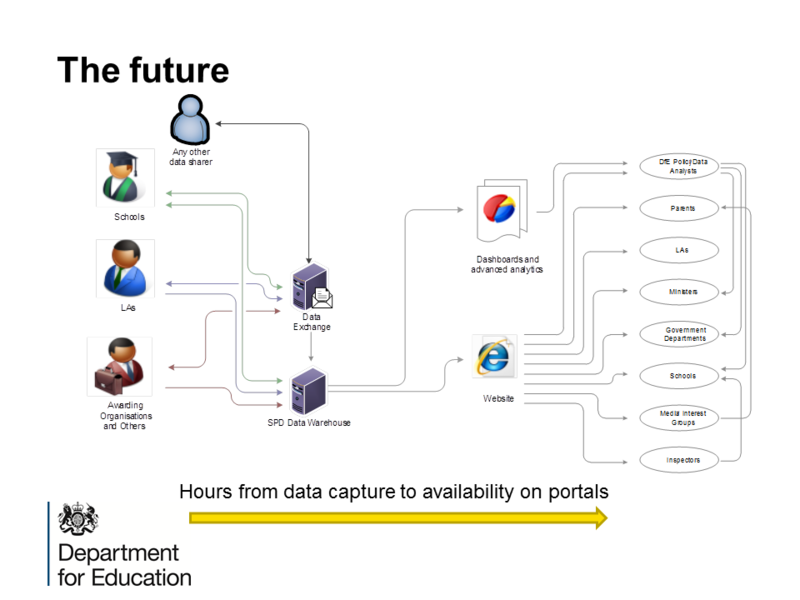 An interesting debate erupted on EduGeek this month after Graham Reed, a technologist, made a post on Eduware Consulting blog about the changing data landscape and how he saw Department of Education (DfE) data exchange and warehouse projects changing the way MIS work and the way they are used. Now of course we need to take it with a pinch of salt, firstly, this is very much early days. At the moment it’s a vision looking to become a project, and we all know how government projects end up post election time. Add the fact Graham Reed is one of those folks trying to push SIF and the interoperability agenda and you start to get the feeling your walking into a sales pitch. With that said, I think the DfE onto a winner. In short, it won’t take them months to produce something useful that by the time they’ve produced it, it’s already out-of-date. On paper this makes complete sense, it’s what happening in industry across the board, it’s what the cloud is all about, automation. It also starts to solve a lot of other issues, generating ULNs for example requires manually generating a CTF then uploading to S2S and finally manually updating your MIS, with the new system, your MIS could do API call to the DfELearning Records Service (LRS) web service and automatically request and update the record with the ULN all without leaving your MIS application and a few clicks of a button. Simple. Take it a step further and pupil transfers could be done the same way, select the pupil who’s leaving, select the new school and it automatically sends the pupil records to the new school! 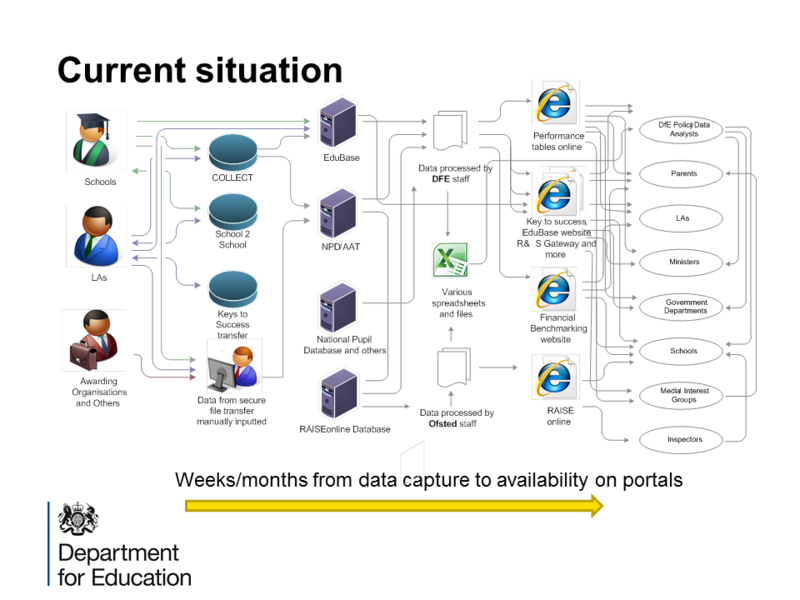 Dual registered could occur the same way, just add the other school and the pupil records are synced between the two, regardless of MIS supplier, via the DfE. Unfortunately, like most things, the problems appear when you start digging into the detail, how is this data used and how is the data currently gathered and why is it so manual? The main issue, in one word, is Census. The Census, to put it bluntly, is used for funding. Now in a world where budgets are on the decrease the last thing you want is to see it drop even further because of an admin error, so you can see why the idea of gathering the raw data in near real-time is a bit worrying. For me, I don’t see this a show stopper. I accept data will be inputted incorrectly or not at all. I know the pains of ethnicity data. I also know the importance of a “approve” button. I know a Local Authority (LA) will most likely have access to most of their schools MIS systems and be able to produce a School Census return, I also know they would have enough data in their own systems to produce a School Census return. The key fact here is that they don’t hit that approve button. That approve button is always hit by the school. Period. So long as decisions aren’t formed on unconfirmed facts I don’t see a problem and I’m not just talking about funding, many other decisions are formed from the School Census data, just have a look at the free reports from Arbor and your see what data there is on your school in the public domain. The general public are becoming better informed and schools are almost having to sell themselves to get more pupils on-roll, to get more funding or even stay open. This is even before we start looking at how services use the School Census data to support schools such as transportation, and not forgetting how researchers use the data for analysis. As long as that approve button still exists in the new DfE system, it’ll be no different then what happens now.